President Buhari vows to ensure bandits, kidnappers, others are not spared – Royal Times of Nigeria. President Muhammadu Buhari says his administration will make sure that those who are violating the laws of the land, especially as it relates to criminality are brought to justice. In a series of tweets on Sunday, the President stated that his administration is committed to addressing the security challenges of the nation. He charged all security personnel to ensure that they do not spare any cattle rustler, armed robber, kidnapper or any person who thinks he is above the law. President Buhari noted that only a safe and secure country can guarantee economic growth and prosperity for its citizens. 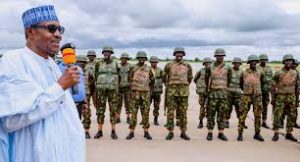 President Buhari disclosed that before he departed Katsina State for Abuja on Saturday, he met with some soldiers deployed in the military operation in Zamfara and neighbouring states. He said he was pleased with the progress made so far by the troops in the onslaught against the bandits and criminals terrorising communities in the state. The President also noted that the Nigerian Air Force is playing a more significant role in the hotspots of banditry, with the deployment of fighter jets to support the efforts of the Army in the North Central and North West regions of the country.